HWPL Peace Education can achieve Dictionary without ‘War’! Having dedicated 17 years to teaching, Mr. Mathias Kevin Osimbo, the In-country Representative of Teachers Without Borders in Kenya, offers unique insights into peace education as one of the many educators who have implemented HWPL’s peace education in their classrooms. “I picked students from the group, peace club, in my school. When the members came, we picked one of the values, ‘empathy’. As the students discuss about this, they came up with their own ideas and definition of what empathy is. Some of them were too emotional and they were shedding tears as they were sharing their life experiences. Peace is so natural, and it’s the best value human beings should have. How can we achieve peace? Peace begins by teaching students peace. Teaching peace from a young age in all textbook, not war heroes and stories, is a source of great change as fundamental solution. If the word war is removed from the dictionary by peace education, culture of peace will prevail in the global community and war will no longer occur. 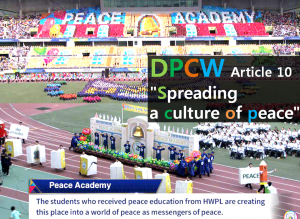 Peace education is one of HWPL’s core initiatives and values education to pass peace on to posterity. HWPL Peace education focuses on developing peace education courses, teacher training, and opening peace classes to enlighten students and foster citizens of peace value and spirit. In order to end the war and leave eternal peace as a legacy for future generations, we need to teach the values needed for a new era of peace rather than the old war-stained ideology. This education provides a fundamental understanding of the basic principles that human beings must observe for peace to be created. 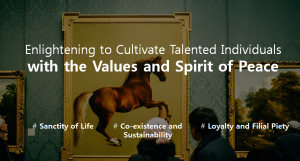 Through the discovery and internalization of these peace values the inner selves of students and their ability to live together in harmony with others in their own community, and even the world, is properly nurtured. In order to successfully cultivate children and young people as messengers of peace, HWPL Peace Education first works to erase previously held ideas and values that are corrupt by directly showing how the world has become evil in the present era, and then plant the peaceful values needed for the new era of peace in their stead. 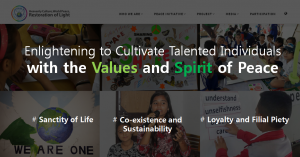 It also introduces a new methodology in which the values of peace can be applied in all environments and real-life situations happening outside the classroom. Currently, 149 educational institutions in 10 countries including the Israel, the Philippines, the U.S. and the Kosovo have been signed up to operate the HWPL Peace Academy in from elementary schools to universities. 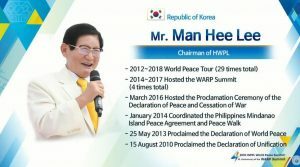 Author masterPosted on 2018년 August 29일 2018년 August 31일 Categories About me :)Tags Chairman of HWPL, DPCW, empathy, HWPL, HWPL Peace education, internalization of peace values, Man Hee Lee, messengers of peace, Teachers Without BordersLeave a comment on HWPL Peace Education can achieve Dictionary without ‘War’!